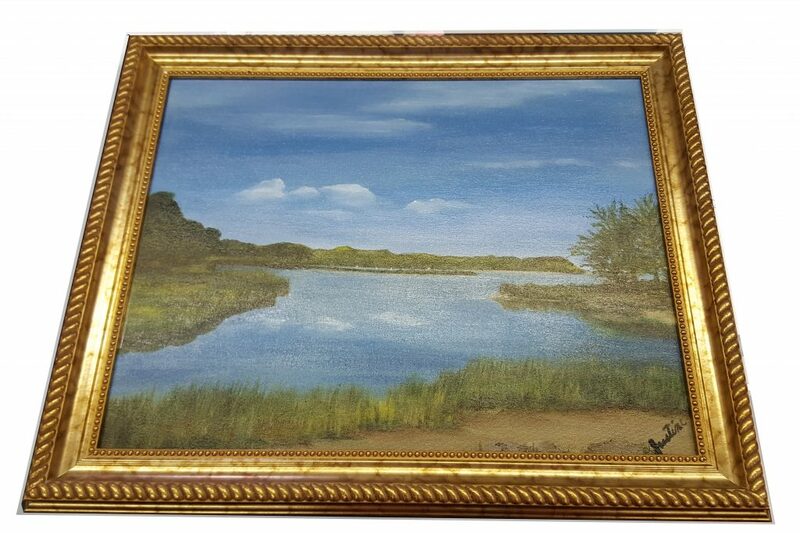 The Respect Life Office Art Sale is selling donated artwork from two wonderful Long Island artists. The proceeds will be used to help maternity residences and other Respect Life needs. This original work of art was donated to the Respect Life Office for pregnancy supportive care. The author was inspired by an image in remembrance of Holy Week. 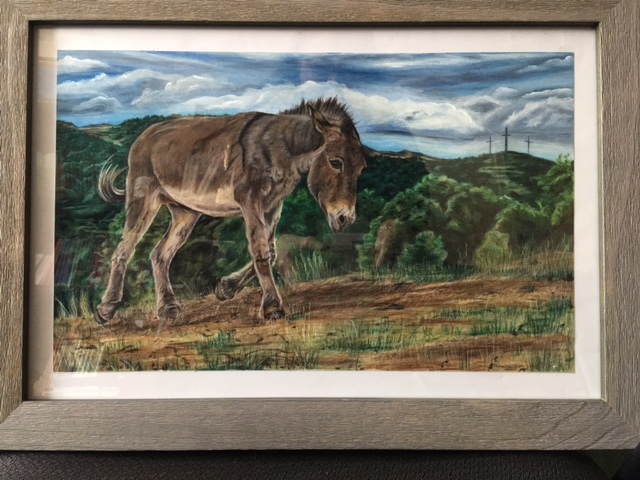 This piece pictures a donkey with 3 crosses upon a hill in the background. It is meant to serve as a reminder that through Jesus we overcome all crosses even death (and the culture of death!). Justine Jannace Lomenzo, born in 1939 lives in Commack, New York, and has four sons and eight grandchildren. Justine started painting in 2008, and unfortunately due to an illness stopped painting for close to two years. After starting to paint again in 2011, she attended classes at the Museum of Art, Vero Beach, Florida and at Plein Air Painting in Southampton. 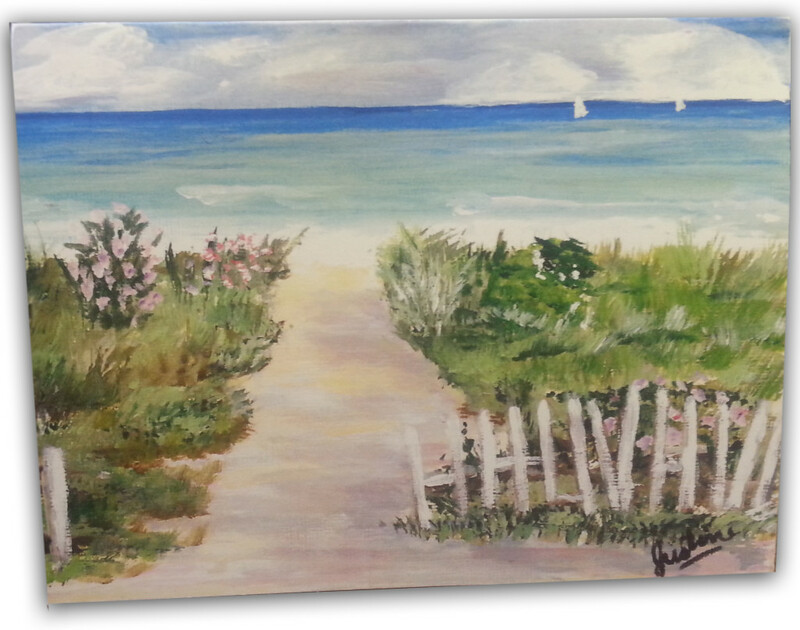 Justine’s favorites subjects are seascapes and landscapes and paints scenes around Long Island for her inspiration. 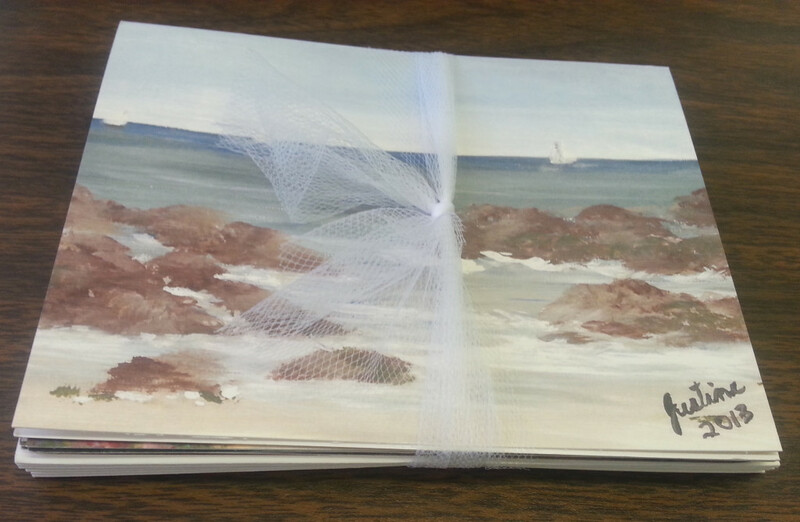 Brighten up someone’s day with a wonderful note using these printed note cards with scenic nature scenes of Long Island. 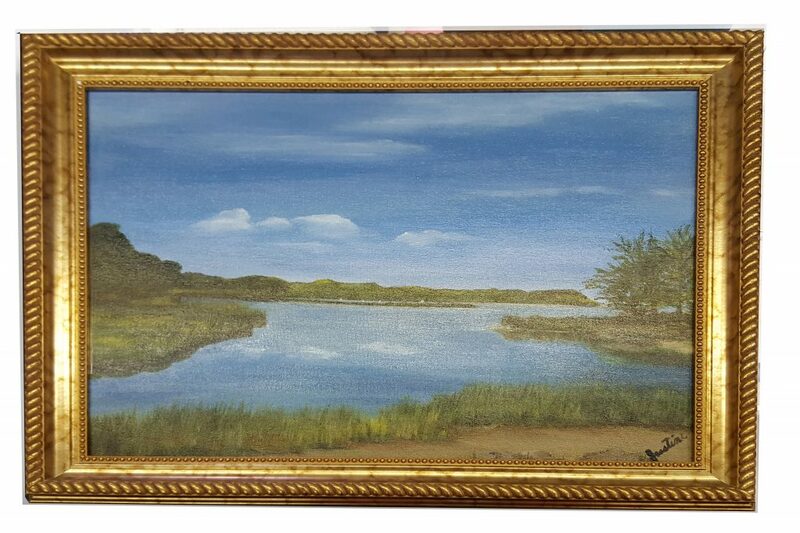 Front: A scan of original paintings of Long Island from local artist, Justine Jannace Lomenzo. Thank you for interest in purchasing a painting. After you have filled out this form someone will get back to you as soon as possible regarding, shipping information and payment. Please allow us time to review your order and to make sure your choice of painting is available. Please note shipping will be not be included in your order but will be calculated separately and given to you directly by phone or email. After reviewing your order we will get back to you as soon as possible. 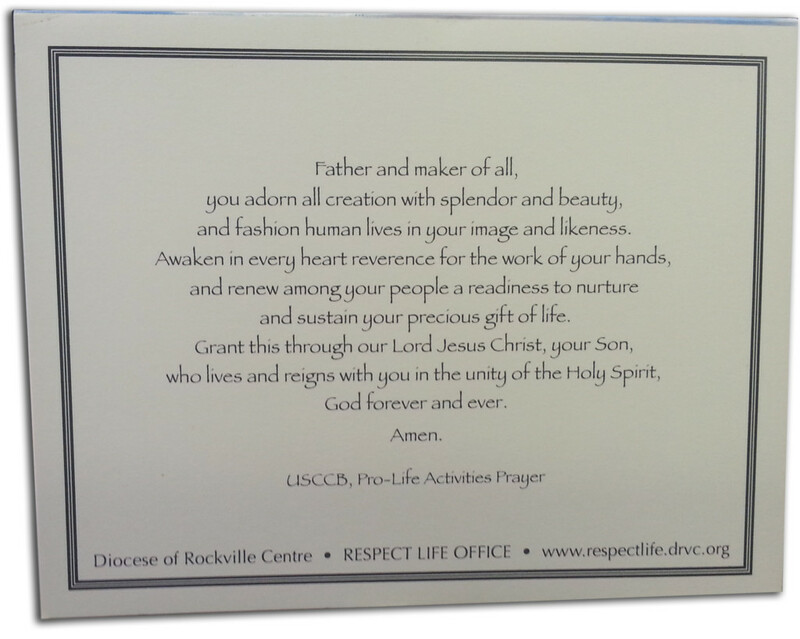 Make check payable to "The Respect Life Office" and mail to: The Respect Life Office, Diocese of Rockville Centre, Attention: Diana Tellis, PO Box 9023, Rockville Centre, NY 11571-9023. Clicking this button will open a new tab in your browser where you can pay by credit card via our donation page. Once on that page please choose "DONATE OTHER AMOUNT" Please remember to also click SUBMIT in the botton of this form so we can have your shipping and contact information.